Restorative justice leaders from around the United States gather to discuss information collected in regional listening sessions. IN A WIDESPREAD, FAST-MOVING FIELD such as restorative justice (RJ), how does a major grant-funding organization discern where to allot funds? One answer: engage with the Zehr Institute for Restorative Justice on a comprehensive nation-wide strategic listening process, followed by a convening of leaders in the field. From December 2016 through May 2017, listening sessions were hosted in regions across the United States: northern California, Minnesota, The Navajo Nation in New Mexico and Arizona, Baltimore/Washington D.C./Virginia, and British Columbia in Canada. The sessions – led by Sonya Shah and co-facilitators – gathered approximately 135 participants to gain a ground-level understanding of how RJ has been developed, is practiced and has evolved regionally. Shah is an RJ practitioner, professor at the California Institute of Integral Studies, and co-founder and director of the Ahimsa Collective. 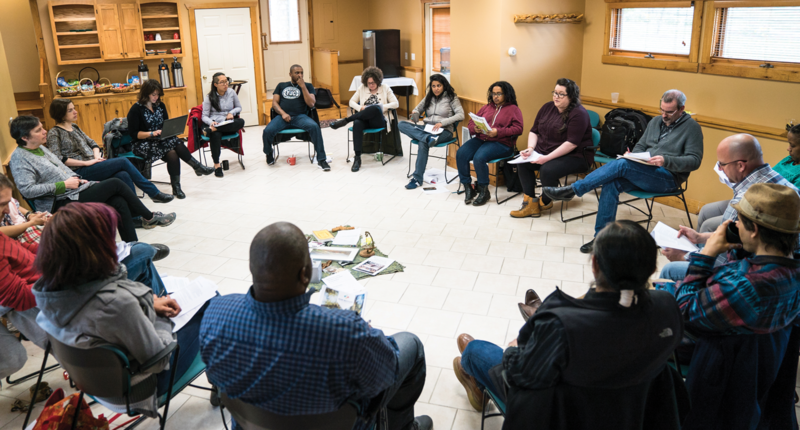 In April, 12 leaders from a variety of venues where RJ is practiced gathered in the Shenandoah Valley to review the findings and to collaborate on building a framework for a cohesive, impactful and long-lasting restorative justice social movement. The group also presented suggestions regarding how the funder can “best use its allotted resources to maximize the impact of its funding and capacitation efforts in support of a durable Restorative Justice movement for the future,” according to a post-event summary. Robert Yazzie: (co-facilitator, Navajo Nation) professor, Navajo Technical University, and retired chief justice of the Navajo Nation,Window Rock, Arizona. Other participants came from the fields of corrections, law enforcement, higher education, domestic violence, youth activism and K-12 education, media, community organizing and politics. The report is being finalized. The funding organization choses to remain anonymous.